BY ERIN VLASAK – IF YOU EAT RIGHT AND TAKE CARE OF YOURSELF, YOU WON’T HAVE TO WORRY ABOUT BURNING OFF THE CALORIES! IT TAKES THE GUESS WORK RIGHT OUT OF THE PICTURE. BY ERIN VLASAK, M.S. AND GINA FRISINA M.S.E.D People choose what food they will eat for a variety of reasons. Some people eat out of stress, while others mindlessly eat in front of the television. Regardless of what food we put into our bodies, it is important that we model healthy eating habits for our children and those young adults around us. It all starts at home. What are our children learning from us about their meals? At dinner time, are our plates full of a lean protein, complex carbohydrate and a vegetable, or is dinner being served out of a paper bag as it was bought at a fast food chain restaurant? If you have not yet visited choosemyplate.gov, now would be a good time. The United States Department of Agriculture provides a large selection of resources ranging from healthy eating tips to printable material to share with your family. Good Nutrition Parents play a key role in educating their children and those around them about healthy food choices and good nutrition. Teachers also have a part in shaping the views and behaviors that students will use in their futures. At home, why not store all those processed food items in the cabinet or pantry, and display brightly colored vegetables and fruit on the counter tops. Have fun with it! Purchase some see-through food canisters, in all shapes and sizes, and add to them delicious healthy foods. If baby steps are needed in order to get your children to eat more healthy foods, try to find a healthy substitute for their favorite snacks/foods. If they can plow through a bag of Doritos in record time, perhaps try to substitute it with a multi-grain or baked chip. One way to get your picky eater to try new foods is to play a fun game of “food fear factor.” Because most children are hesitant to try new or different foods, providing them the opportunity to try new foods, in a game format, may encourage them to do it as they may enjoy the challenge. Make the food appealing to their eyes and they will also be more likely to try it. Challenge them to try blue corn tortilla chips dipped in homemade guacamole. Once they like the taste of new foods, educate them on the nutritional values of the food and allow them to learn that by eating this, they are benefiting their bodies in that way. And one more helpful tip – playing food fear factor at a time of the day when your children are most likely to be hungry increases the odds they will try new foods. 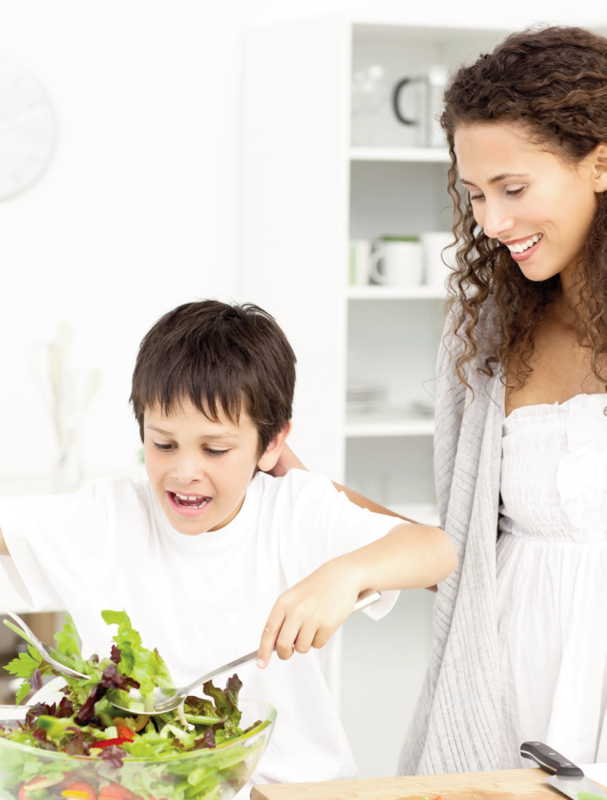 If you children do not already cook or prepare meals with you at home, it is highly encouraged to have them start. What better education do we give our children than having them cook alongside of us and teaching them, in the moment, what the food is and why it is good to eat. Why not teach our children which foods come from the ground, which grow on trees and contrast that with foods that are processed and packaged in a plant. portion distortion Over the past 20 years, our portion sizes have increased, if not doubled in some cases. When we view oversized portions of food as normal, this can be called “portion distortion.” It is important to get children accustomed to accurate portion sizes in order to help them maintain healthy eating habits. Using items familiar to children to demonstrate portion sizes can be an easy way for them to remember how big or small the portion should be. OUT OF PROPORTION: Portion sizes have increased, if not doubled in some cases, over the past 20 years. Portion distortion results when we view oversized portions of food as normal. ABOUT THE AUTHORS: Erin Vlasak is the Director of Student Support Services for the New York Institute of Technology-Vocational Independence Program. Erin oversees the social counseling, residential life and fitness programs. She has a Master’s degree in College Student Development from Long Island University and a certificate in school counseling. Gina Frisina is the Director of Independent Living for the NYIT-VIP Program. Gina oversees the daily living skills and the banking and budgeting programs. She has a Master’s degree in special education from Dowling College.